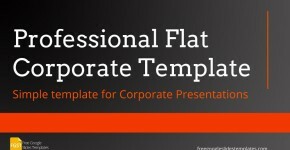 The Professional Flat Corporate Presentation Template is a clean and modern presentation designed for personal, business or corporate use. It’s very easy to adapt with your content such as text, images and charts. At Free Google Slides Templates we create free to use presentation templates for different purposes, always trying to provide professional design and ease of use. Created entirely with Google Slides Shapes, each section is editable and customizable. The backgrounds are configured through the Google Master Slide as a Professional Google Slides Theme, in order to allow the user to include new slides with the same look and feel. The Free Google Slides Template is created with a red/orange color palette, with a dark gradient backgrounds. This modern color combination is complemented with the Arvo and Open Sans fonts. Free images and icons are displayed. The user can replace this placeholders with its own content. You do not need access. Just open the template in Google Slides and make a Copy. The second slide of the template provides instructions.